At the time I first began my Tioga George Blog in 2003, I made a promise to myself to be of help to my fellow RVers. Below I am posting a suggestion. I believe that this suggestion will be of great help to you. It is to use "LastPass". Click [here] to go to the LastPass site. I use LastPass Premium which costs $12/year, and is very much worth it. If you do not use the Premium version, LastPass is free. LastPass is very much like a Bookmark manager for websites which require you to have s User Name and Password. Your websites are stored in LastPass in an almost perfect, secure environment. You may use your LastPass on your computer and have it sync to you LastPass on your cell phone. You may receive a Trial LastPass by clicking the link above. A clerk at the Wal*Mart Neighborhood Grocery informed me that plastic bags will soon not be used for packing purchased items. Wal*Mart will instead offer what appeared to me to be cloth bags with a handle. These cloth bags will be offered for sale @ $1/each. 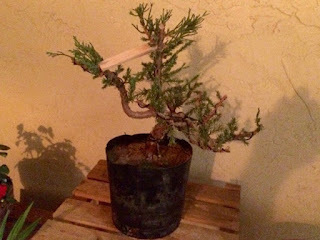 I don't remember when I bought a small Juniper Tree at Hunter's Nursery. Must have been many months ago. I did not do anything with this tree, because I did not know what to do! Then I read [this] web page. Now I know, pretty much how to structurally prune my Bonsai tree. Below is a before and after pic. Do you remember when I wrote to you that my taking up the "Art of Bonsai" was a very optimistic enterprise for me? Do you understand why I wrote that? I was not aware that the new plastic bag law was in place in Los Angeles. From what you commented, it appears as though the thing is working OK. Remarkable! I have stored a zillion bags in order to use them for waste basket liners. When I run out, I'll go buy bags. The other thing I find amusing about the whole issue, is the places that have banned the plastic t-shirt bags have seen a dramatic increase in the purchase of trash-can liners. Don't know about anybody else, but that's how I reuse all my plastic shopping bags. Thank you for your take on the plastic bag dilemma! Why don't the law makers who crafted the plastic bag law, craft a law to ban gasoline in California? Here in Canada we have to pay 5 cents for each plastic bag where they used to be free. Also, we now need to put a looney (one dollar coin) in the shopping cart before use and it is returned when we return the cart -- in the past we they didn't require any money. lastly, every time I'm at the check out there is a lot of pressure to sign up for the Walmart high interest credit card. I now have began shopping elsewhere. Those things that you wrote about, I believe, have been tried before. Even the $1 coin in the shopping cart. Didn't take though, because competition between groceries used "shopping cart shaggers" to outdo competitors. Soon, the shopping carts were free again. Where we lived in Spain there was a charge for plastic bags. Most folks walked to the grocery and used those pull-along 2 wheeled carts to put their groceries in. That was several years ago. The city (in Ohio) where we're at this summer has been trying to get a city ordinance that stores charge for plastic bags (to encourage folks to bring their reusable bags). I kinda like the idea of having to pay to use a cart... would definitely cut down on the carts rolling around in the parking lot. I'm like Judy... we use our plastic bags for household garbage, and what we don't use we take back to the store and put in the recycle box. Having picked up tons of litter from the highways and byways, anything to keep folks from throwing their trash along the roads has to be a plus! I can just see it now! Shopping cart bans. Everybody brings their own cart to shop. Maybe our destiny is to have groceries with no parking lots? Walk to the market pulling your own shopping cart. Save the environment by not driving cars to the grocery. Would that work? How about all that extremely wasteful packaging? Maybe a law will come out to ban those environmentally bad printed boxes with pictures describing the luscious contents? George, I can't make comments. Could you fix this? Sure! I can fix it! Often I forget the reusable bags I keep in the car so after checking out off I go with groceries "helter-skelter" in my cart! 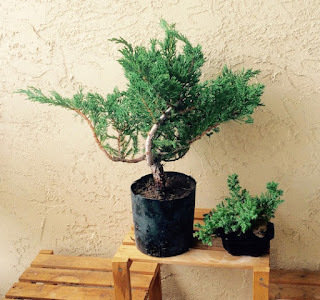 :) :) thanks for this post, George, and I like the before and after pictures of your tree. Now we have to wait while the Bonsai Twee grows fluffy and fills out. I wonder how long we will wait? I've used LASTPASS for some time, I think it's great. Do you use the Free Version or Premium Version? Since I change my passwords frequently I occasionally print the LastPass passwords to a pdf file as a backup which I then encrypt. It is a great program that keeps your passwords the same over multiple computers and has a stored copy on your computer if you can't get internet access. You like LastPass too? I love this program and wonder why everyone doesn't use LastPass? What I don't understand is that if they ban the plastic bags, which was done last time I was in San Diego and Merced, CA, what about all the plastic wrappings on most of the items IN the plastic bag? Most things in a box have plastic also (like cereals), chips, pretzels, etc. have plastic bags, all those terrible hard plastic shells that are impossible to open are made of plastic. So what about those? At least I can recycle the shopping bags for trash, but not the others. Why don't they make recyclable plastic bags? Then they wouldn't harm the landfill. Well the after is a bit disappointed but i think its all well.